It’s not necessary for you to have watched 1970’s Kung Fu movies as obsessively as I did and still do to enjoy THE MAN WITH THE IRON FISTS but it sure doesn’t hurt. This is the real thing in that while watching it I actually felt like I was in a 42end St. grindhouse back in the ‘70’s. The only thing missing was the smell of pot and the snoring of a wino in the last row. The style and characters and story are such vintage Kung Fu movie swave that it’s easy to just settle back and enjoy the sheer outrageousness on the screen. In the small community of Jungle Village there is constant warfare between various clans battling for supremacy. The Lion Clan is the most powerful and due to special weapons created by Thaddeus the Blacksmith (Rza) they are able to defeat their hated enemies and prepare for a huge shipment of gold bullion that is to be transported through their village. It’s guarded by The Geminis (Andrew Lin and Grace Huang) and an army of warriors equipped with rapid firing crossbows. 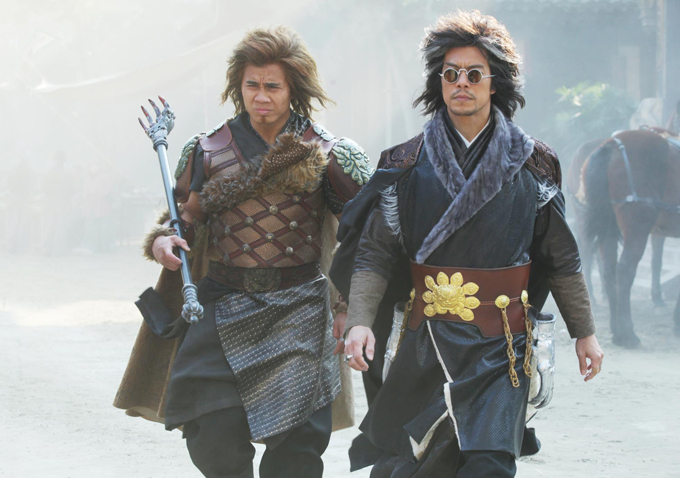 But this doesn’t deter Silver Lion (Byron Mann) the new leader of The Lion Clan. What does worry him is that Zen Yi, The X-Blade (Rick Yune) is returning to Jungle Village to investigate his father’s highly suspicious death. 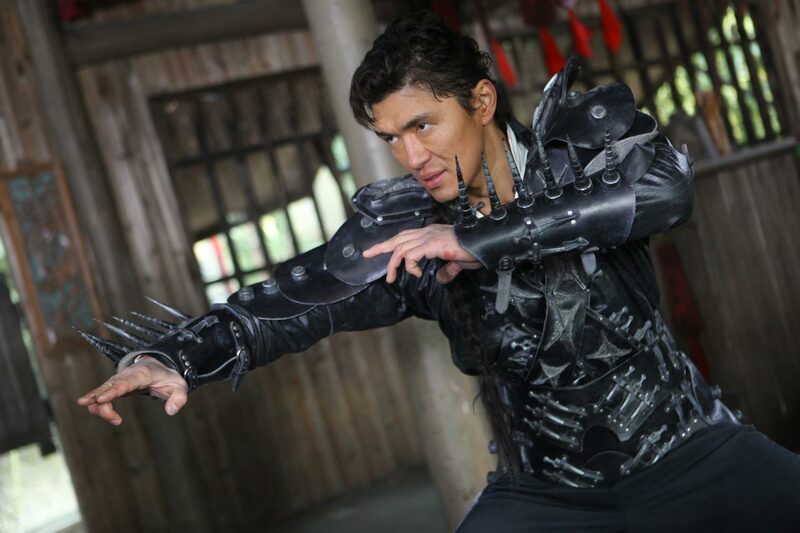 Silver Lion hires Brass Body (David Bautista) a seven foot tall mercenary who backs up his superhuman strength with the supernatural ability to turn his body into living brass to kill Zen Yi. Meanwhile, a mysterious stranger right out of a Sergio Leone western comes to town. Jack Knife (Russell Crowe) apparently is there only to smoke opium and bang as many of Madam Blossom’s (Lucy Liu) whores as he can. But his hedonistic behavior hides a cunning, devious mind that has schemes on getting the gold himself. Thaddeus is content to stay out of the conflict. He only cares about earning enough gold through his blacksmithing to buy his girlfriend Lady Silk (Jamie Chung) out of Madame Blossom’s service and build a new life together far away from Jungle Village. But Thaddeus soon learns that everybody must pick a side in the epic battle for possession of the gold. Even him. THE MAN WITH THE IRON FISTS starts out fast and strong and never slows down it’s plot for an instant. There’s always something interesting happening on screen, whether it’s a knock-down-drag-out beatdown or Russell Crowe getting his freak on or Silver Lion scheming with a mysterious hooded man to get the gold. All the while Rza is narrating in a voice that sounds nothing like how I imagine a black man in the 19th Century would sound. Matter of fact, Thaddeus sounds like he came to Jungle Village straight from Brooklyn’s Brownsville. But oddly enough, it just adds to the fun of the movie which also borrows heavily from spaghetti westerns. It’s also cool how each of the characters have their own special weapons with the standouts being the combined Bowie knife/pistol carried by Jack Knife or the armored suit that is made up of bladed weapons worn by Zen-Yi which gives him his nickname of The X-Blade. You don’t go to a movie like this for the acting but it helps when it’s as good as it is here. Madame Blossom is a role Lucy Liu could play in her sleep but she throws herself into it fully. Rza was a little too laid back for me to be the main character but I think it was a wise move for him to let the more experienced actors carry the bulk of the movie. Rick Yune and the Master Killer himself, Gordon Liu also do solid acting jobs. I had a lot of fun with Byron Mann as Silver Lion because if there’s one thing I love, it’s a bad guy who enjoys being a bad guy. He struts through the movie with a psychotic grin and hair that any member of an 80’s heavy metal band would envy. 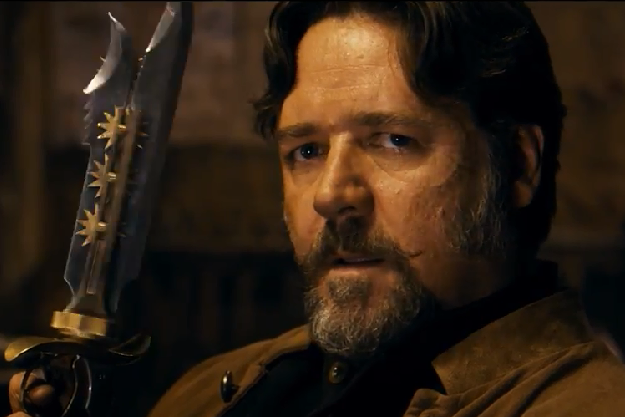 But nobody in the movie throws himself into their role with as much gusto as Russell Crowe. He looks as if he’s having the time of his life being in a Kung Fu movie and for much of the movie’s running time we’re not sure what the deal is with this guy Jack Knife. When he’s not drinking or smoking dope or banging whores he’s creeping around the village in disguise, quietly gathering information and observing what’s going on. So should you see THE MAN WITH THE IRON FISTS? Absolutely. I loved how this movie is such an unashamed throwback to those wonderful 70’s Kung Fu movies done with style, fun and substance. Everybody looks as if they had a great time making it and from the sound of it the audience I watched the movie with had an equally good time watching it. I know I did. Not much of a fan of Eli Roth myself. “Cabin Fever” did nothing for me and “Hostel” disgusted me to the degree that it has the dubious honor of being the only DVD I’ve ever thrown away. Usually I give away DVDs I don’t like or want anybody but “Hostel” doesn’t deserve to be watched. I don’t care for his work but not to such a degree that I was not going to go see this movie just because his name is on it. Yeah same here. My respect for RZA was big enough to counterbalance my dislike of Roth. Same with Inglorious Basterds. 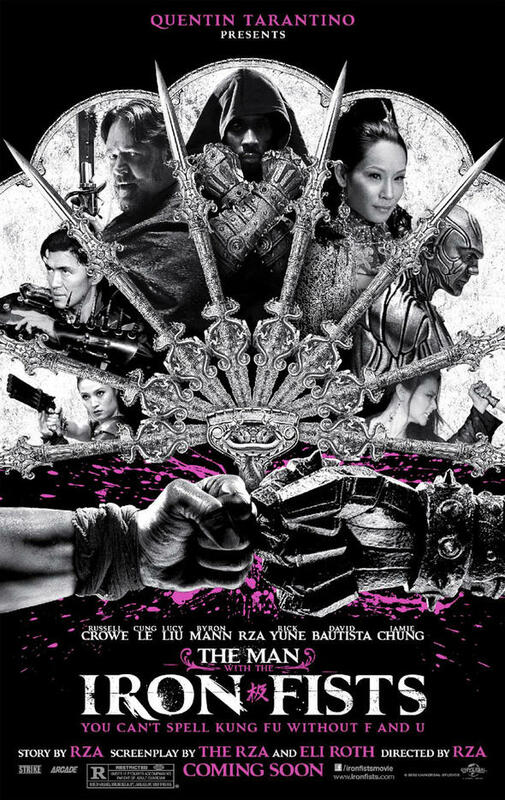 There is no adequate way to describe to anybody how utterly and totally outasight THE MAN WITH THE IRON FISTS is to anybody. It’s a movie you just have to see for yourself. My wife Patricia loved it and normally she can’t stand Kung Fu movies but she says she’d go back and see it again, that’s how much she enjoyed it. And like you, I’m keeping my fingers crossed and hoping that we’ll get to see the four-hour version on DVD/Blu-Ray. The story is that Rza wanted to chop it up into two movies, much like how Quentin Tarantino did to “Kill Bill” but Eli Roth talked him out of it. Yeah…Roth…I’m not sure I trust that guy. I’m not really a fan of anything I’ve seen him do. RZA’s love of old school wuxia flicks was really up there on the screen. He hit all the marks, even down to the deliberately wrong tense in the opening titles and the little kid who blurted out ‘How formidable!’ when he smashed the anvil (I laughed out loud at that – awesome).